When winter hits Detroit, it hits hard – especially for those who are homeless or in transition. We all know how much colder the day and night can seem without gloves. For thousands of children and adults in Detroit, a single pair of gloves to protect their hands is a luxury they cannot afford. You can help change that. Your gift will help us reach our goal of providing over 53,000 pairs of new mittens and gloves to those who need them. Donate now and help Mittens for Detroit warm hearts, two hands at a time. Because of people like you, Mittens for Detroit has worked with a network of about 100 partners to distribution one-quarter million pairs to people in Detroit, Hamtramck, Highland Park, and Dearborn. Such a small thing as a pair of mittens or gloves can make a big difference. YOU can be part of making this difference today. Thank you for your generosity and help in keeping Detroit warm since 2010. YOU make this possible. Monetary donations allow us to purchase new mittens and gloves when the public collection does not fulfill the needs of the agencies, schools, shelters, veterans’ groups, and others in our Distribution Partner network. Your tax-deductible financial donations allow us to purchase new, unused mittens and gloves from Michigan-based 3rd generation Broner Hat and Glove at a very reduced rate. A cash donation of $35 buys 5 pairs of adult’s gloves that would retail at $20 each, for example. 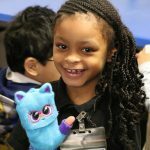 We hope you will consider becoming a monthly donor to Mittens for Detroit. You can join the Handwarming Heroes Circle by clicking http://bit.ly/HandwarmingHero. As a monthly donor – a Handwarming Hero – you will be helping to support our mission with a recurring donation of your choice, a minimum of $10 per month. This gracious donation will allow us to better plan our annual budget and help with funds during the summer months when our general donations are lower. 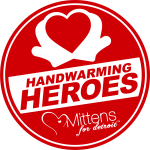 As a Handwarming Hero, you will receive perks from us as a token of our appreciation – advance notice of events, discounted tickets to our annual fundraiser Giggles & Gloves (the Sunday prior to Memorial Day), discounts on our MFD Merch, and some surprise goodies as well! We very much appreciate our generous donors – we hope you will join Team Mittens with a donation today! Thank you!